Shakespeare's genre-defying masterpiece gets a new treatment at the Stockwell Playhouse this July. Perhaps Shakespeare's most intimate look at the price of fame and the limits of love, Antony & Cleopatra is a wild and sweeping story that poses a timely question to modern audiences: What is a woman's role in power? The Company of Antony & Cleopatra is made up of an international team of young actors and creatives all working in London--appearing in the cast are graduates from RADA, Drama Studio London, East 15 Acting School, Guilford School of Acting, Rose Bruford, and more. Daniela Stirbulov (Assistant Director) is an international theatre director from São Paulo, Brazil. She is also a graduate of the East 15 Acting School Theatre Directing program. She has directed Loucas de Pedra, Menino Maluquino O Musical , and been resident director Os Dez Mandamentos O Musical and Memórias de um Giogolô in Brazil. Laura Arroyo-Rocha, Sylvia Spyratou and Ioanna Lantzanakis are extremely talented graduates from Wimbledon College of Art's Theatre Design MA program. They have teamed up to design all three East 15 shows that will be happening in Stockwell Playhouse. 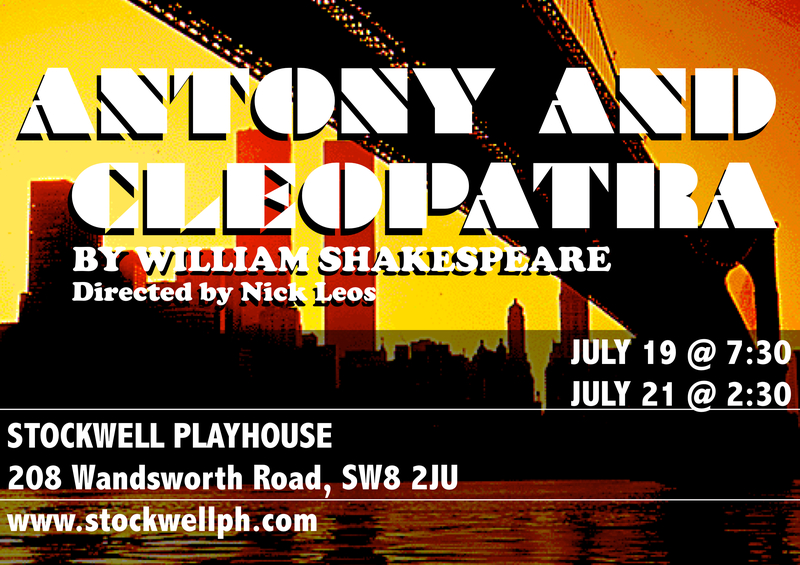 We are teleporting the story of Antony & Cleopatra from the ancient world to 1970s New York City. The forces of corruption, financial collapse, and political strife brush up against a world of disco, dreams, and sexual liberty. Driven by a passion for Shakespeare's timeless text, we are hoping to create a production that examines the female relationship to power, by recasting some of the lead roles as women, and employing women to play male roles. We want to examine Shakespeare's commentary on gender and how it reflects our modern interpretations of female empowerment. We are seeking crowdfunding to help bring our vision to life for London audiences. All of the funds raised through this campaign will go directly into helping produce this expansive piece. We are hard at work rehearsing, researching, and developing this play, and are planning to use the funds to execute the design of the show, and to reimburse actors for time and travel expenses. You don't need to give money to help us succeed! Please share this project with anyone you think would support us – on Twitter, Facebook, LinkedIn, by email, telephone, in a chat over the fence, playing XBox Live or on your blog. For £5 Donation you will receive a shout out on our social media pages for your support! For £10 you will receive a shout out on our social media page, and receive the line Octavia whispers in Caesar's ear as she leaves with Antony. For £25, you will receive a social media shout out, Octavia's secret, and a print of our poster signed by the cast and crew! For £50, you will receive a shout out on our social media, a copy of Octavia's secret, a poster signed by the company, AND your name as a supporter in the Antony & Cleopatra programme! For £100, you will receive 2 Tickets to the show at Stockwell, your name as a supporter in the Antony & Cleopatra programme, as well as a signed poster, Octavia's secret, and a thank you on our social media page! Thank you for helping this show reach it's funding goals! For your generous donation of £150, we will send you a special vinyl record used in the show and signed by the company, you'll also receive TWO tickets to the production at Stockwell, your name as a supporter in the programme, a signed poster print, Octavia's secret, and a shout out on our social media page! It doesn't get much better than that!